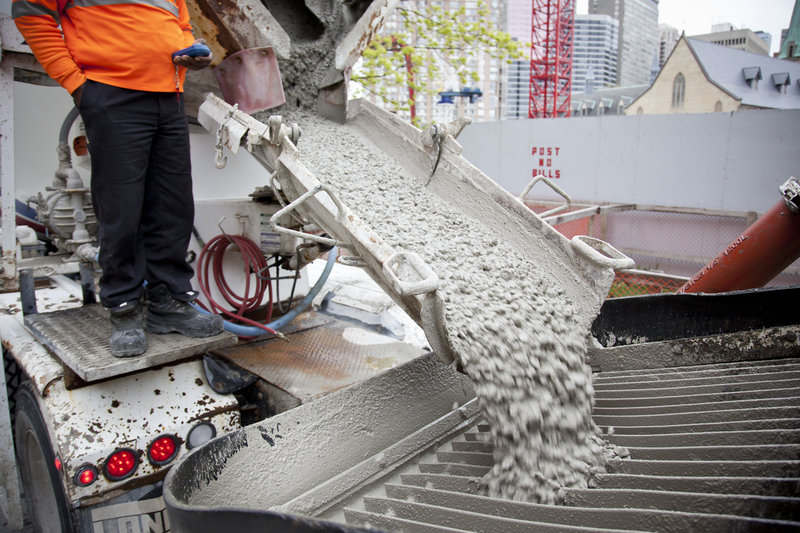 Concrete is often the material of choice for bridges and buildings, roads and sidewalks, ports and dams, offshore production platforms and homes. Dufferin Concrete is proud to offer a large range of products and services across a wide geographic footprint. Dufferin U-Track is a mobile application solution that provides real-time data allowing customers to verify and track their concrete orders on their mobile device. At Dufferin Concrete, we are proud to offer our customers solutions that help them run their businesses more efficiently. In 2014, we launched our mobile truck-tracking application, Dufferin U-Track. The app provides real-time information giving Dufferin Concrete’s customers an effective tool to manage concrete pours. “The Dufferin U-Track app works in a simple and effective manner allowing registered customers to review and track their concrete deliveries using the mobile application on their smartphone or tablet,” said Peter Moylan, General Manager, Dufferin Concrete. The app uses GPS technology to tell customers exactly where their delivery is – a critical piece of information when dealing with a perishable material like concrete. Customers can track their delivery from order to pour and see up to seven days of future orders, allowing them to review the order for accuracy, effectively manage their resources and plan their job sites accordingly. We’re proud to offer this value-added service to our customers in an effort to continuously innovate and improve the customer experience, a part of our commitment to provide added value to every job and every customer. The application is available at www.dufferin-utrack.com for registered customers. If you have not yet registered, visit the U-Track by Dufferin Concrete signup form to register online. Enviroguard is a self-contained chute washout system that captures and recycles cleanup water following a concrete pour. 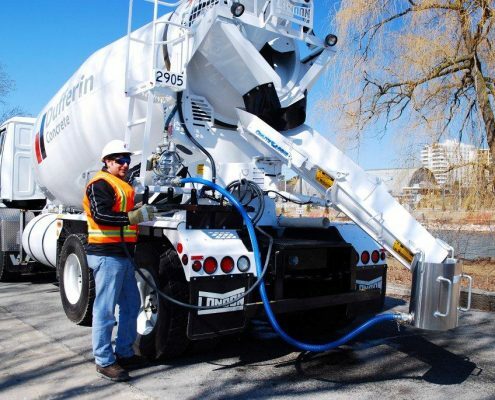 Dufferin Concrete prides itself on being an industry leader and is committed to equip all our ready-mix trucks with this environmentally friendly system. As a sustainable solution, Enviroguard meets the green building standards and is both timely and efficient. It effectively eliminates any concrete chute wash water released into the environment. It is environmentally responsive with water recycled and reused, cost effective, efficient, quick to install and simple to operate. The closed system stays on the back of the truck allowing the drivers to clean their chutes anywhere without causing a job delay. Envirogaurd helps eliminate the need for construction site cleanup, resulting costs and promotes recycling materials. With tight project budgets and space, this sustainable solution provides many benefits on a project site. E-Invoicing is an ideal way to get your invoices. They are sent directly to your inbox rather than waiting for them to be delivered by mail. With society immersed in the digital age, businesses are beginning to convert to electronic forms of tickets, invoices and receipts. Following the electronic form, CRH Canada has launched electronic invoicing (e-invoicing) to ease customer interaction and make business easier than ever. The invoice is electronically sent through an email to up to three addresses in your organization. With the electronic version of the invoice, the customer is able to choose if they want it sent weekly or monthly. E-Invoicing will send your invoices in PDF format directly to you via email as soon as they become available, avoiding lost or delayed invoices. Weekly invoices will arrive immediately allowing you to complete your accounting cycle quickly and efficiently. If you choose to receive a monthly statement, that will be delivered to your inbox on the second day of each month. We are pleased to offer e-invoicing as part of our value-added services and hope that you will find it a useful tool to help you manage your operations more efficiently. Invoices will no longer get lost in the mail and time looking for a backup invoice will be reduced. In an event that an e-invoice is misplaced, a copy of the invoice will still be available on our customer self-service portal, as it is today. Construction projects and sites are becoming more complicated and congested than ever before. 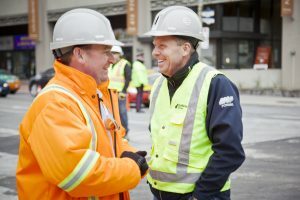 The size of projects, scope of work, aggressive construction schedules and number of subtrades working on a single site can put huge demands on Site Superintendents. 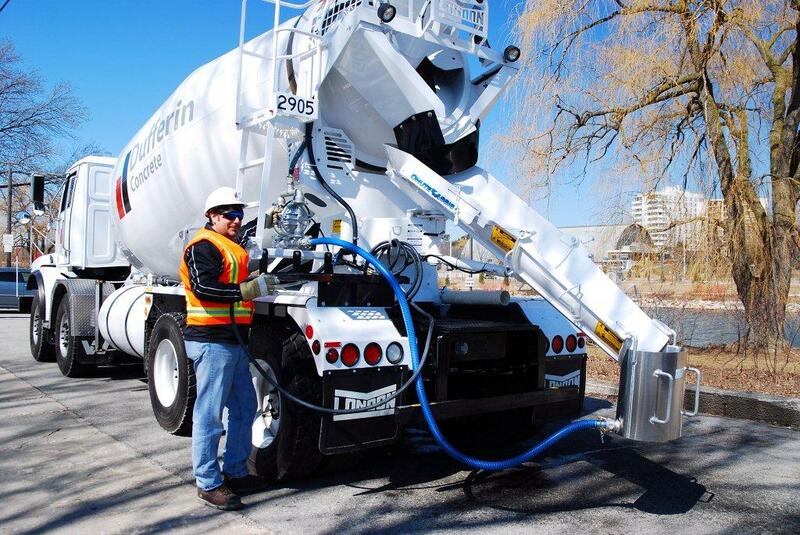 To help our customers better manage their job sites, Dufferin Concrete now offers site supervision in order to assist in concrete pours involving major volumes, high profile pours or pours involving complicated concrete specifications. Dufferin Concrete recently completed a major wind turbine project near Seaforth Ontario where the General Contractor took advantage of this new value-added service to ensure all major and high profile pours went smoothly and to spec.